Addiction is a topic dear to my heart so Don’t Worry He Won’t Get Far On Foot is a film that touched me deeply. 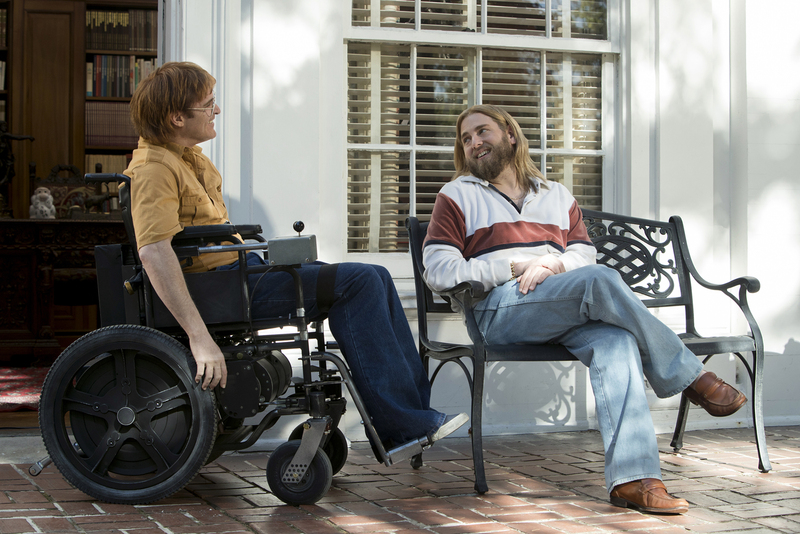 Originally set to star Robin Williams who optioned the Portland, Oregon, cartoonist John Callahan’s autobiography 20 years ago, Joaquin Phoenix is in sensational form as the story’s protagonist, an alcoholic paraplegic in a wheelchair tackling sobriety with the help of a small circle of allies. The film opens with Callahan in bed, before his accident, explaining that he woke up without a hangover due to the fact that he was still loaded from the night before. He generally experiences about an hour of the day before severe anxiety kicks in and he begins drinking heavily again. As the film moves back and forth through different time periods we get a sense of what drove Callahan to drink, and what drove him – literally – into a wheelchair. 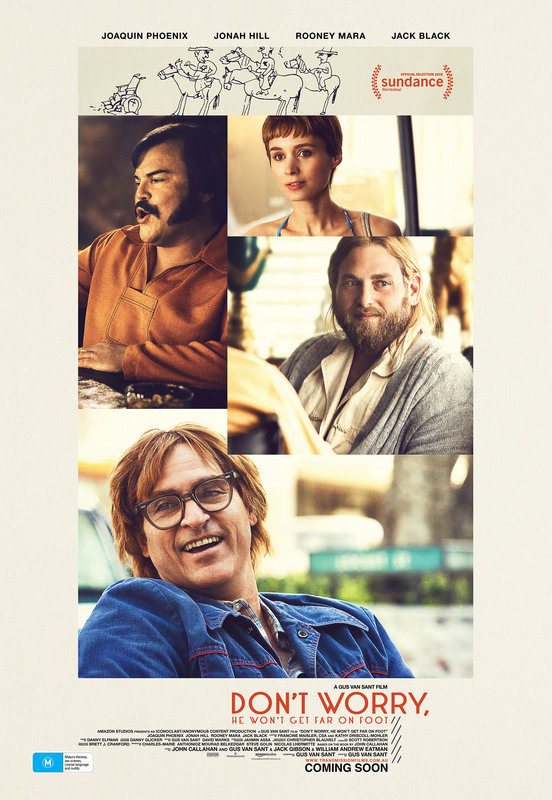 Along the way we meet Jack Black as Dexter, a key figure in John’s past during his wild partying days and Jonah Hill, unrecognisable as Donnie, a kind of “Jesus-Lite” self styled recovery guru who hosts a weekly group chat in the lavish home he has inherited from his family. The other members of the recovery group feature some rock and roll royalty including Beth Ditto as Reba, an unapologetic redneck with a no-nonsense attitude and Kim Gordon as Corky, a divorced housewife with a fondness for pills. Rooney Mara as Annu, meets John as a carer visiting him in hospital when he is first unable to walk, before becoming a more substantial part of his life. In the years after the accident that left him paralysed, Callahan found fame, or infamy, as a cartoonist, with work that was wonderfully dark and deliciously politically incorrect. In the film he struggles with sobriety and explores the reasons he drank to excess, with help from the group. The story is dark, deep, confronting and hilarious. From director Gus Van Sant whose previous 16 feature films have included Milk and Good Will Hunting, this is a glorious examination of the psyche of addiction and the road to recovery, as well as an inspiring portrait of a troubled person who was able to turn their life around. John’s story is partly told through a series of confessional speeches at his group therapy sessions and onstage speaking to a large audience as a famous cartoonist. This feels like the first glimpse of some of the Oscar contenders for 2019.